Wow. There were times in that first half I could have nodded off. The second was much better, and it all built up for that final crescendo. Peter Hartley's header, for Plymouth, has sent a large part of Devon into ecstasy this evening. Here's Brent Pilnick's match report from Home Park. Portsmouth, a club that has been through so much in recent years, are destined for a fourth season in League Two. The joint-lowest scoring match of the play-offs so far has just given us the drama that we love football for. That date again for your League Two diary, 30 May. Just a quick heads-up ahead of tomorrow night's Championship play-off match. Sheffield Wednesday lead Brighton by 2-0 after their first-leg win at Hillsborough. Ross Wallace and Kieran Lee were the goalscorers as the Owls got one over the Seagulls on Friday. Who'll be flying high come full-time? There'll be a full live text commentary as well as BBC Radio 5 live coverage from 19:00 BST tomorrow. "The noise here is deafening. Peter Hartley is already a hero among these fans, but that goal to send them to Wembley has put him into Argyle folklore. "The only downside is a group of fans who have invaded the pitch and are taunting their Portsmouth counterparts as the on-pitch party continues." Where did that come from? I was preparing myself for extra time and then up rises Peter Hartley. "Que sara, sara" rings around Home Park. Portsmouth had their fair share of second-half chances, but looking back, over the whole match, I think Plymouth slightly edged it. It looked like missed opportunities from Jamille Matt and Jake Jervis may have cost them, but not to be. They are off to Wembley and will face either Accrington Stanley or AFC Wimbledon on 30 May. Quote Message: Plymouth were miles the better side in the second half. They used the attributes they had - height at set-pieces. They put so many crosses in the box and, sooner or later, it was going to pay off. Plymouth were miles the better side in the second half. They used the attributes they had - height at set-pieces. They put so many crosses in the box and, sooner or later, it was going to pay off. From bust to Wembley in five years. 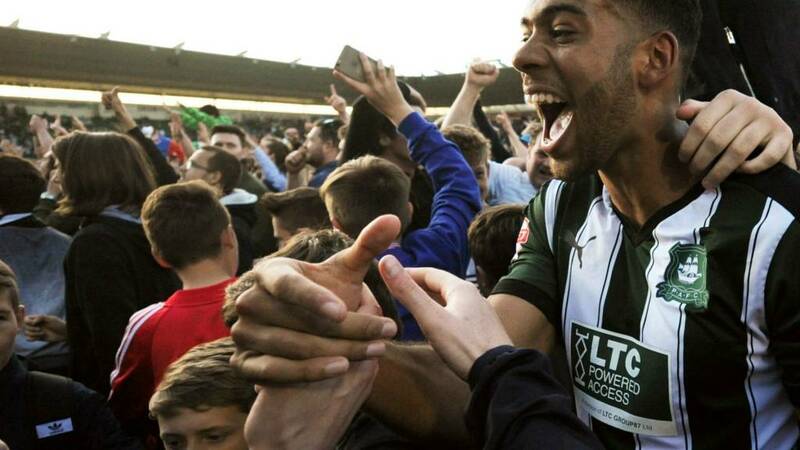 Plymouth nearly went out of business in 2011, but now they are on the verge of getting back into League One. Your hero this evening, ladies and gentlemen, is Peter Hartley. There's a pitch invasion at Home Park now, and deservedly so. It's been dogged, it's been tense, but Plymouth Argyle have probably just edged this. In an effort to grab the equaliser, Conor Chaplin is on for Kyle Bennett. Goalkeeper Ryan Allsop lets the ball go over him from the corner. Hartley, at the back post, heads the ball on target and it deflects off the back of the defender and in. Manager Derek Adams sets off down the touchline. Scenes. Home Park is rocking. Both managers still urge their team on, and now up goes the board. It's the big two minutes. Jake Jervis. Jake, Jake Jervis. The ball into the box from Craig Tanner is almost perfect. Plymouth's Jervis has a free header, six yards out, and hits the base of the right hand post! Less than five minutes to go. It's time to become that man to write the headlines and send your team to Wembley. Both teams love a late goal (who doesn't? ), Plymouth have scored most often late on with 18 goals in the last 10 minutes of their matches this season. Portsmouth aren't far behind, they've scored 17. Close from Ben Close. The Portsmouth man fires high from a matter of yards out. Big chance again. It all came from a Portsmouth free-kick 30 yards from goal, which they worked well down the right. Kyle Bennett cut inside and it very nearly found the head of Adam McGurk, but it deflected behind for a corner. Quote Message: This one isn't for the faint-hearted now. This one isn't for the faint-hearted now. Too right, Paul. Only a few minutes left for either side to find a goal, otherwise it's extra-time at Home Park. The fans, like the chairmen, are still singing and creating a great atmosphere in this tense match. "Having not expected to have come on until about now, first-half replacement Ben Close is having a great impact in midfield for Pompey. "His distribution is excellent and he doesn't seem to be overawed at all by this tense occasion." Pompey have already lost two men to injury in this game, and now it's Plymouth who have the concerns. Jake Jervis challenges for the ball on the edge of the Portsmouth box but in landing he hits the deck straight away. He hobbles off, can he carry on? We will wait and see. Off goes the winger who's being causing problems for Portsmouth, Gregg Wylde. Craig Tanner is his replacement. It's Plymouth's first roll of the dice. It's off the line by Portsmouth as Graham Carey arrives at the back post to knock down the header from a yard out. Thankfully for the team in blue, they have two men on the line and get it clear. The Dockyard Derby becoming more of a canal-side cruise at the moment. Portsmouth's Ben Close is booked for a foul on the halfway line. Deja vu here though, following that challenge, Pompey manager Paul Cook is being spoken to, along with Plymouth boss Derek Adams. No one sent to the stands this time though. We've just seen an image of ex-Burnley striker Robbie Blake on the touchline. He's part of the Portsmouth coaching staff these days. Blake's been there and done it being part of the successful Clarets team that went up to the Premier League through the play-offs in 2009.